Sew Awesome: Ein stein, danke. Isn't this the coolest name for a beer ever? Pretty good brew, too. A tad bitter for my taste, but I guess you probably get that with a German beer. All beasty 500ml of it went down pretty nicely though. That wall-hanging dressform behind it is a gift from my rad psuedo-mother-in-law Doris. After one of my previous posts she decided it was a shame to have my work hung on coathangers, and sent me two of these babies as a surprise. Isn't she awesome? I have my maroon 1940s dress displayed on the other one just out of frame. 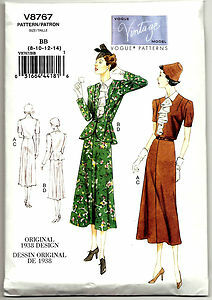 Today I finally started work on version 2.0 of the 1938 suit jacket from Vintage Vogue 8767. So there's no doubt now that that carpet is made of synthetic fibres. Then I ran out of interfacing, got my pattern pieces muddled up, and in an Alzheimer's moment, misplaced my last piece of lining and couldn't find it again. So that project swiftly went back in the do-another-day bucket.